Is The Pentacel Vaccine Right For Your Child? The Pentacel vaccine helps to immunize children against diphtheria, haemophilus influenzae type B, pertussis, polio, and tetanus — all serious diseases caused by bacteria or viruses. Pentacel may be used as a replacement for the separate doses of DTaP5, IPV, and Hib. If you’re wondering if this vaccine is right for your child, this guide provides helpful information about the benefits and possible side effects. What are the benefits of the Pentacel vaccine versus separate vaccines? Pentacel helps to reduce the number of injections that a child receives within the first 18 months of life. This combination vaccine can also boost the level of protection against diseases. Five doses of the Pentacel vaccine are administered over a period of time — typically ages 2 months, 4 months, 6 months, and between 15 to 18 months. However, the first dose may be given as early as 6 weeks of age. The fifth dose should be administered to the child between 4 to 6 years of age. If a child has previously received separate vaccine antigens, Pentacel may still be given as long as the minimum time interval has elapsed. Most infants and young children can tolerate the Pentacel vaccine without suffering from major reactions. As with all vaccinations, a child may experience irritability, fussiness, and crying afterwards. Skin reactions may include redness, tenderness, and swelling around the injection area. Severe reactions, such as encephalopathy, Guillain-Barré syndrome, or other neurological disorders, are rare but possible. • Would you like to schedule individual vaccines or combine some of them in one? • Do you believe that a combination vaccination will help improve compliance? • Are you considering reducing the potential risk of your child experiencing adverse reactions? 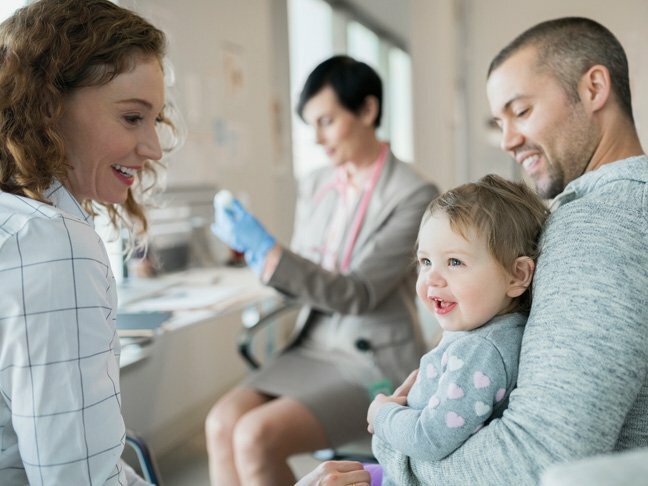 Discuss your child’s health and any conditions or ailments, such as high-grade fevers or allergic reactions, that may have occurred since birth with the pediatrician. The physician can help you determine if Pentacel will be a safe alternative. Once you weigh all of the factors involved in choosing a combination single-vial vaccine, you should be able to make an informed decision for your child’s vaccination schedule.